We know we’re always repeating it, but small business really is the heart and the driving spirit of America. In fact, according to the latest data from the Small Business & Entrepreneurship Council (SBE), as of 2016, 89% of employers in the U.S. are companies with fewer than 20 employees. And we’re not the only business who understands how vital entrepreneurship and small business is to our country’s economy. Since 2010, American Express has been supporting and promoting small business with their incredible campaign Small Business Saturday, now called Shop Small. Since its inception, the US Senate made it official in 2011, and communities and consumers across the nation have embraced the tradition. In 2016 a record number of shoppers participated – 112 million of them! This year Small Business Saturday falls on Saturday, November 24. Below you’ll find a list of steps you can take that will help you this year, and throughout every holiday shopping season. Plus, we’ve included tips that are just smart online marketing no matter what time of year it is. So one of the cool things about Small Business Saturday being created and sponsored by a huge company like American Express is all the free promotional materials you can take advantage of. Not only are there resources to give you plenty ideas such as blogs, videos, and inspirational stories from other small businesses, but there are things you can download or order to create posters, stickers, and other print materials you can display or hand out. In addition, there are kits to create assets for your website and/or social media campaigns. There are even tools to help you organize events with other small businesses in your local community, or to create a pop-up store if you’re an e-commerce business. Even if you think there’s no time to organize anything for this year, AMEX does this every year, so mark your calendar for next year now, so you’ll be prepared. Year-Round Tip: Looking for free materials you can print out or use online at any time of the year? The Google Small Thanks is a program aimed at small businesses that does just that. We don’t mean you should sleep through Small Business Saturday. Even if the holiday shopping season snuck up on you, it’s never too late to update what local online marketers call your business NAP. NAP stands for Name, Address, and Phone Number. If you want to make sure you show up in Google search result, it’s crucial for your business contact information to be consistent and up to date everywhere it appears online from your website to your Facebook page to Yelp and nearly 200 more local listing sites. It’s also a good idea to make sure your website URL and email addresses are accurate. You don’t want a potential customer to click on a link to what they think is your website or your email address, only to get an error message instead. So while you’re updating everything, make sure you check on your online addresses as well. Furthermore, inaccurate contact details and other information will cost you more than just your Google ranking. Your inaccurate online listings are also costing your customers. It’s a fact that 80% of people will lose trust in your business because of incorrect or inconsistent online details. That’s a lot of potential customers to lose out on if you ask me. Year-Round Tip: Besides your NAP, your URL, and your email address, these days you also need to stay on top of your reviews, and any new Google My Business features like Questions & Answers that Google decides to add to your listing. 3. Don’t compete with the big stores or large online retailers. It might be tempting to copy the Big Box stores like Target, Walmart, Home Depot, and others by drastically slashing your prices for Black Friday, or doing things like opening at 4 am. And while sales, promotions, and other incentive programs are all smart marketing choices, you don’t have to cut into your profit margins or risk going out of business because you took a loss on Black Friday. Those large stores can afford to lower prices well below retail and sometimes even wholesale for a couple of hours to a full day, but can you? The same thing goes for you if you’re an e-commerce business. Don’t compete with Amazon, Google Shopping, and eBay. If you sell on these services, definitely offer Cyber Monday deals if you can, but there’s no need to compete with Amazon’s online doorbuster Cyber Monday deals on their branded products or offer free shipping on all orders from Black Friday through Cyber Monday. Instead, remember why your customers come to you and magnify those things. People shop on Small Business Saturday and at small, local businesses in general because they want to support the community, and because they’re looking for more personal service than a large chain can provide. Year-Round Tip: There’s no reason why you can’t make friendly customer service a priority all the time. Remember, your customers come to you because they want to feel like family and part of the local community. Ensure all your employees are trained in customer care, starting with how your business answers the phone. 4. Partner with other merchants in your community. Small Business Saturday is not a day for competition with other small businesses. Instead, it’s a day to celebrate small business and the local community. The day is the perfect opportunity to partner with other small businesses. Again, American Express has advice for ways to join forces with other merchants near you, as well as tools for hosting a Shop Small event in your local area. If you’re an online-only business, you don’t have to miss out on events going on in your city or town. Etsy and American Express have partnered to help you reach out to local small businesses in your area to do things like host a trunk show at their location or take over one of their store windows. You can also do things like open up a pop-up shop in a vacant storefront that’s for lease or at a booth at a neighborhood Small Business Saturday event or festival. There’s no reason you can’t be part of the day just because you don’t normally operate your business out of a brick and mortar location. Year-Round Tip: You don’t have to wait until Small Business Saturday to form a partnership with other local merchants. Developing small business co-ops and other partnerships can help you pool resources for everything from marketing to hosting other community events throughout the entire year. If you’ve been unsure about how to market your small business on social media, then promoting Small Business Saturday is the ideal opportunity to get started. Post on the social media sites where your customers hang out. If they’re on Facebook, post there. If they’re on Twitter, then tweet. Take photos and post about what you’re doing on Instagram. Use hashtags (#) in your posts on social media sites like Twitter, Instagram, and Facebook, so they’re easy for people to find who are searching for what’s going on near them. Because Small Business Saturday has been around for nearly a decade, the day comes with readymade tools including hashtags, so you don’t have to come up with your own. The official hashtag is #ShopSmall, but you can also try #ShopSmall, #SmallBizSat and/or #DineSmall. In 2016, almost 250,000 social media posts used those hashtags, so you definitely want to get your business in the conversation this year. 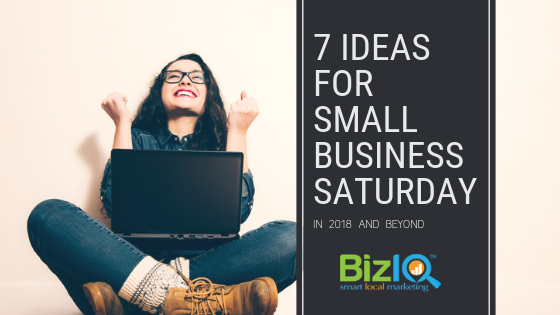 All of these things are free, but if you want to make sure more people see what you’re doing and to bring new customers to your business this Saturday, then you might consider boosting your Facebook posts, or creating ads on social media to help advertise any Small Business Saturday promotions or events going on around your neighborhood. Year-Round Tip: Social media marketing is an excellent way to help customers interact with your business, and it’s also a budget-friendly way to get your feet wet with online advertising. Facebook, for example, has some of the most powerful audience targeting of any platform, including Google, and it’s less expensive. Speaking of online advertising and social media, don’t forget about creating promotions and special offers to draw more people to your business for Small Business Saturday. Besides social media, you can create email campaigns and newsletters to send out to your customer lists. If you haven’t been collecting customer contact details, then this year’s Small Business Saturday is the perfect time to start. Ask your customers to signup to receive regular updates via email when they visit your business or store this Saturday. That way you’ll be prepared next year. In addition to your social media posts, consider updating any paid media campaigns like PPC and display advertising with your Small Business Saturday specials. If you’ve never tried PPC, maybe now is the time to start. If you’re at a loss for ideas for promotions you can try discounting clearance items or offer a free upgrade or add-on item to all purchases this Saturday. Consider having a contest like a drawing where the winning customer must be present to claim their prize. Again, you can promote all of these incentives via email, social media, and digital advertising. Year-Round Tip: Holiday shopping season and Small Business Saturday isn’t the only time you can use email and pay-per-click advertising to market your business online. You can run specials any time of year. Between the corporate ads for Black Friday and the Amazon promotion of Cyber Monday small business owners might feel left out in the cold during the holiday shopping season. However, the history of small business is entwined with the history of the United States. It’s virtually impossible to separate the two. And while there have been times in recent history when it looked like huge corporations might mean the death of small businesses, entrepreneurs everywhere have continued to strive and prevail. Even if you haven’t done much to prepare for Small Business Saturday this year, it’s not too late to take advantage of this Saturday, and it’s never too late to get started marketing your business online. Post on social media, partner with other businesses, run specials and consider advertising them online – the sky’s the limit when it comes to bringing in more customers and growing your business. Are you doing anything for Small Business Saturday this year? Let us know in the comments below and don’t forget to subscribe to our newsletter and share this post on social media. Need help? You’re never more than a click or a phone call away from a BizIQ local online marketing specialist. Click below to chat, email, or call us right now.